I have to admit I was trying to figure out what to post for today's post and then my husband said we were out of shampoo and asked if I had any somewhere in the house... Boy did that turn out to be an interesting experience.. So after Gregory asks me if we have out of shampoo I set off to our linen closet in our master bath. This is usually where all the remaining unused shampoo and conditioner go when I'm come across something else in the store. Now not only did I found four half full shampoos but I also found seven yes, SEVEN half full or more conditioners... SERIOUSLY?! I don't even know what to say after making this discovery but I know I want to punt myself for wasting so much money! LOL But with that being said I think I may have discovered my "HOLY GRAIL OMG IT'S SO MAGICAL" shampoo & conditioner and it is actually one my best friend approves of! 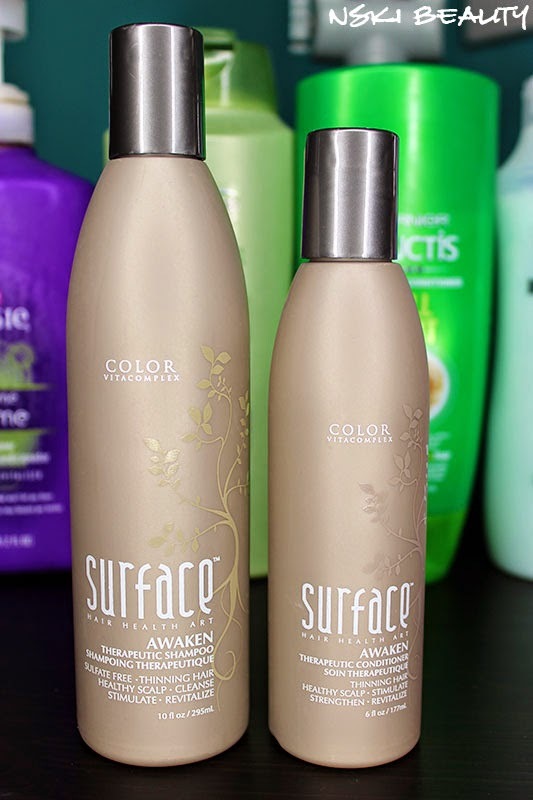 Surface Awaken Therapeutic Shampoo & Conditioner. It's pretty much feels like putting icy hot on your scalp except for the fact your scalp doesn't get hot... But when you rinse your hair a hot shower feels cold on your scalp... I don't know how to explain it but let me just say it feels AMAZING! Now lets get down to some details. While Awaken is an amazing and awesome product I don't use it every time I wash my hair because it is a pretty expensive product. A 10 oz bottle of the shampoo & 6 oz conditioner will run you $42! Which can be quite a painful expense. So to stretch its life I try and use it once to twice a week and just use what ever drugstore brand shampoo and conditioner I have in my shower. (Sorry Jacqui! LOL) However I know the moment it runs out I'll be hitting up Bii Hair Salon! Are you a shampoo/conditioner Snob? Or a "Good To The Last Drop" girl? Shampoo & Conditioner graveyards happen ALLL the time at my house. I get bored with either the smell or what it's doing to my hair so yeah, I feel your pain. I'm really particular though to always buy the pair.. If I get one brand of shampoo, I have to get the same brand conditioner.. weird I know. That's a little pricey for my taste, I wonder if there's a competitor brand that has the mint in it that will have the same effect? I always like to do a cleanse of products every so often. I use up what we have before buying any more, and this includes all the hotel minis. I find a lot of good shampoos in hotels though haha. I am mostly a bedhead gal though. I'm definitely more of "use the same shampoo and conditioner until the last drop" type of gal. Right now I'm using Hask's Argan Oil shampoo and love it! I have never heard of having to use the shampoo twice. I have to try that out. The shampoo I am using now I am not feeling and ready to try a new one. I'm for sure a snob when it comes to shampoos and conditioners. It has to smell amazing - and do amazing things to my hair! I won't settle for less! I am a shampoo snob, all the way. I tend to rotate at least once a week. I want to try this shampoo and conditioner! But the shaving the legs one and not the other... yes... you are not alone! It has happened more times than I'd like to admit! Definitely putting this on my Must Try list! The icy hot sensation sounds like something my overworked scalp would enjoy lol thank you for sharing this! Wow, this shampoo and conditioner sounds AMAZING! I definitely would like to try these out. Always looking for new haircare, great post! I totally need to try these products on my hair! I love finding amazing salon shampoo like this!! Interesting concept for shampoo. 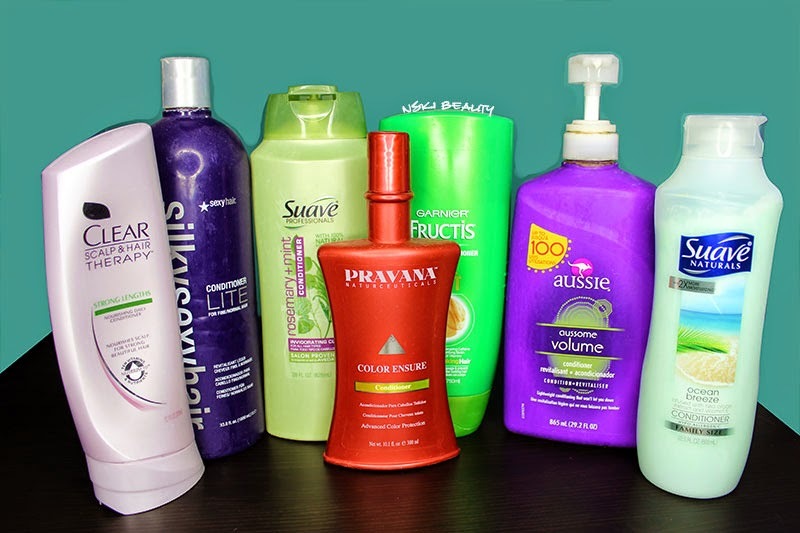 I can't say that I have as many bottles as you, but I do the same thing with using different shampoos and conditioners. I just buy whatever I feel like at the time. My hair is crazy so I like to try different things. This sounds like a shampoo I would love to try, but I don't think I could justify dishing out that much money on it. Yikes.